This was the topic of a gathering at Acadia University on February 28, 2019, organized by Acadia Students’ Union Rep for Theology, Zachary Goldsmith. The MacRae Centre partnered with the ASU to organize and fund the evening. Rather than simply set up a binary argument about science and faith, we invited three Acadia University scientists who believe in God to discuss how they reconcile the existence of God and their commitment to scientific inquiry. At the end of the evening, the opening question was asked again. The results are posted below and you can see the numbers of people who changed their minds during the course of the evening. Perhaps the two most significant observations are that several changed their mind from ‘Mostly compatible’ to ‘Absolutely compatible’, and those who moved from ‘I have no idea’ to ‘mostly compatible.’ One person moved from ‘absolutely incompatible’ to ‘mostly incompatible’ which is only significant because it represented a shift of 50%. While there was some movement through the grid during the night, it probably is as reflective of ‘bias confirmation’ as it is of any genuine shift of opinion. That does not negate the importance of these evening events where we have opportunity to explore the beliefs that people hold, and how faith in the contemporary context is perceived, experienced, and expressed, by a variety of people. For Christians it appears to have been an opportunity to strengthen their confidence in the contemporary context, where faith and science are often unnecessarily set at odds. You can watch the recording of the event below. Can faith and science co-exist? A Panel discussion with three scientists who believe. 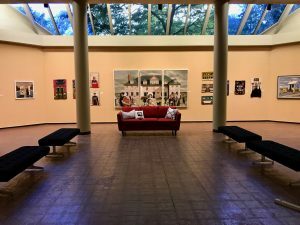 In the heat of last summer, the Acadia Art Gallery presented an exhibition beautifully curated by Dr. Laurie Dalton entitled, Whose Maud? The title, and artwork, compelled gallery visitors to consider the identity of Maud Lewis, and the concept of commodified identity – to whom does an artist and their work belong? And what about us? Artists Steven Rhude and Laura Kenney produced works and studies of Maud, and her experience that explored beyond the sentimentality of Hollywood to the honest struggles and sometimes grim backdrop of her life. 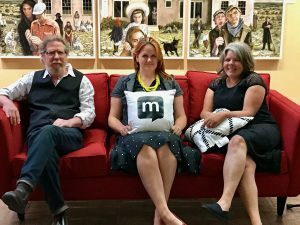 I was privileged to spend a couple of hours on the red sofa with all three of these experts on Maud at the Acadia University art gallery. I was excited by the ideas we explored, and hoped the conversation would be interesting for those who know a little about Maud, but would like to explore more about her life and work with those who have done research, and know quite a bit about it. I also hoped the discussion would help to open up the world of art to people of faith who are unsure about how to encounter and engage an artistic space, particularly an art gallery. One of the best ways we can learn to engage culture is by engaging with art, as it expresses, and demands, asks questions of us, and causes us to ask questions in return. Living in London, if I needed a fresh look at the world, and to be driven out of my usual grooves of thought, I would make a visit to the Tate Modern art gallery. Inevitably I would be challenged and changed and be given fresh insight for whatever project I was working on. We are blessed beyond measure to have an art gallery as part of our university here in Wolfville. I visit here for the same reasons. Its diminutive size does not diminish its impact. The light was beautiful that morning in the art gallery at Acadia. You can see the way it plays on the colours in the room in the photograph above. Unfortunately, we ended up with problems with both the sound and the video recording from this conversation, and so I refrained from posting it at the time, resolving to rebook a conversation at some point in the future. However, February 18 is Heritage Day in Nova Scotia, and this year we are honouring the person and contribution of Maud Lewis. I thought it might be worth posting these videos, hoping that some might at least listen and gain something from them. The sound is echoey, and the video is monochrome. But as you listen, you will hear a challenge emerge. Have we commodified Maud? How does identity become commodified anyway? Is art only for mass production and printing on socks so that we can possess it? Or does it mean something else, something more? Do we really care about Maud Lewis? How much do we commodify our relationships? One another? Allow ourselves to be commodified? Will others like the real me, if they new the whole story of my life? The first video below considers these sorts of questions among others. and in the second, the artists introduce a few key pieces from the exhibition. Scroll down to the third video to hear from Dr. Dalton how she goes about curating an exhibit, that will offer guidance to help you engage with the world of art. The final two videos are the uncut full interviews for diehard fans! Happy heritage day, as we celebrate Maud Lewis. FEARLESS is a six-week small group video resource complete with leader’s guide that will help your group tackle head-on the fear and disorientation that life as a Christian in today’s world can bring. I’m not very proud of my initial reaction to hearing about Anthony Bourdain’s death by suicide. I didn’t voice my reaction out loud, it amounted to a thought that quickly flitted through my mind, but I’m still not proud of it. Today is my husband’s birthday and we should be celebrating…yet we are mourning 52 precious Palestinian lives. Today we should be together watching our daughter grow but we are forced to live separately because Israel controls the borders and has a history of separating Palestinian families. We can only imagine what it was like for Jesus’ friends to awaken that day empty and bereft. For us, we feel a tension (or if we don’t, perhaps we should) between following Jesus to the cross on Friday, and celebrating life on Sunday. We are still as a country in the midst of truth and reconciliation. Truth first. We should not brush lightly over facts like this article does, and lightly pass by the call to cull human beings, or simply disregard the fact that the land was occupied. Indigenous people are not asking Nova Scotians to forget Cornwallis.